Each year I like sharing posts that were favourites with my readers. Here are the top 5 for 2018 in order. Click the titles to read the posts. 1. Gumboot Girls: I participate in a monthly online book club. 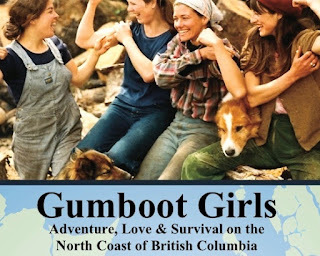 My review of the memoir anthology Gumboot Girls edited by Lou Allison and Jane Wilde was a hit. They have recently released a new book Dancing in Gumboots about the Comox region on Vancouver Island. An anthology about women's lives in the 60s and 70s. 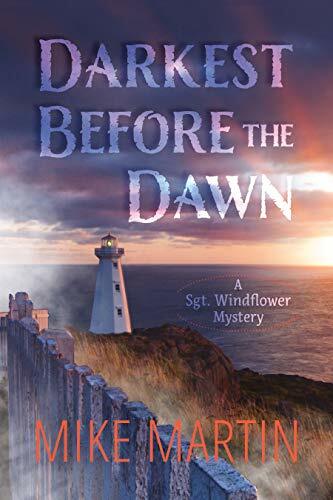 Related Post: Darkest Before the Dawn by Canadian author Mike Martin. 2. 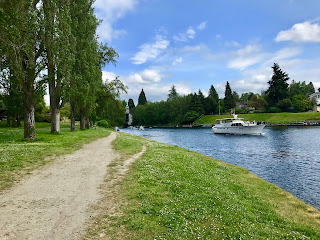 Lake Washington Ship Channel: Wayne and I enjoy traveling for college sports. 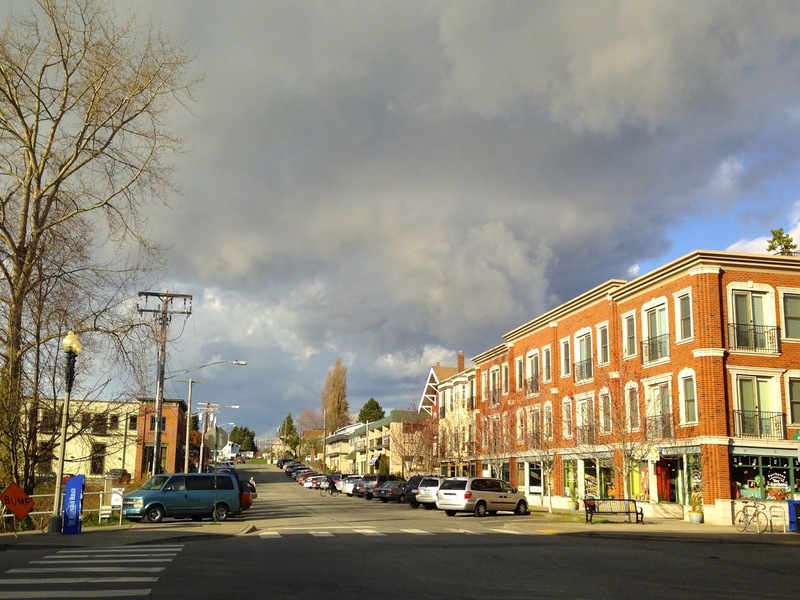 The University of Washington is within driving distance from our part-time Bellingham condo. Here we enjoy football, basketball and softball games, plus sightseeing. 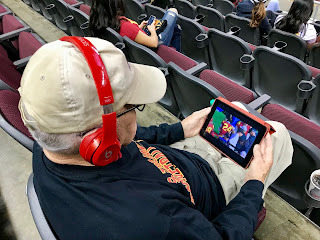 Related post: USC Basketball Sport-cation. 3. 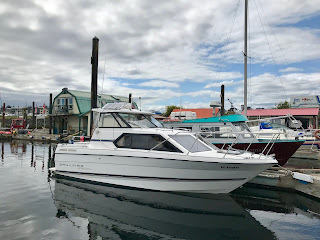 Cruisin' to Campbell River's Discovery Harbour Marina: We keep our 24' Bayliner at the marina in Powell River. From this home base we can explore many destinations along the BC Coast and popular Desolation Sound. Our 2452 at the Discovery Harbour Marina for the night. 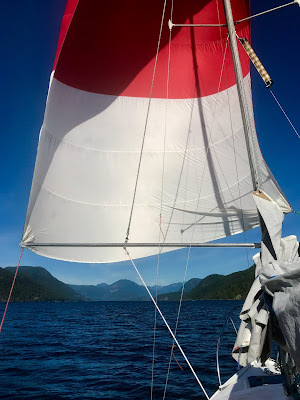 Related post: An overnight cruise to Van Anda on Texada Island. 4. 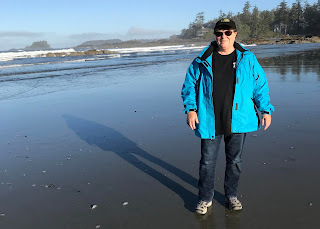 Tofino and Ucluelet, BC: Last May I had lots of fun on a trip with my friend Yvonne Maximchuk to the west side of Vancouver Island. We visited galleries, beautiful beaches and then the Filberg Lodge in Comox for her art show. 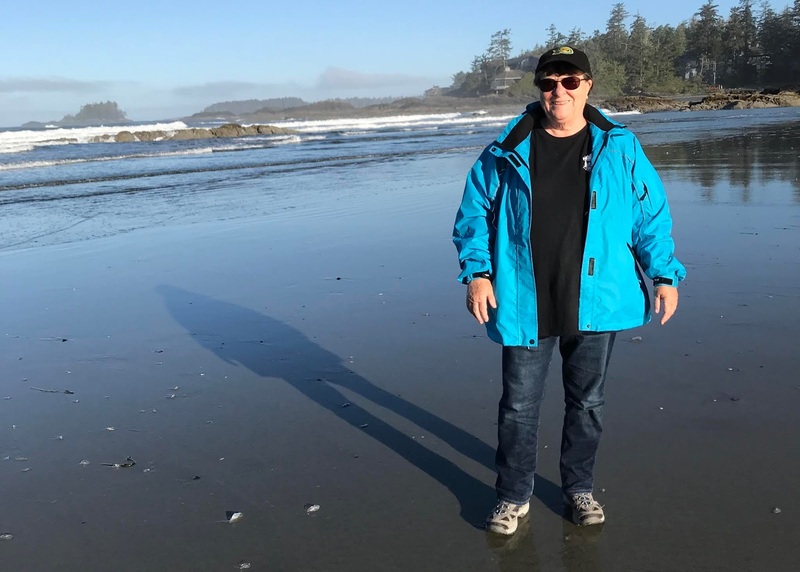 Here I am at Chesterman Beach on a misty day. Related post: Drawn to Sea by Yvonne Maximchuk. 5. 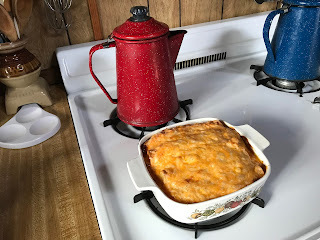 Make Ahead Breakfast Enchiladas: I find lots of interesting things to make by following blog parties and hops. 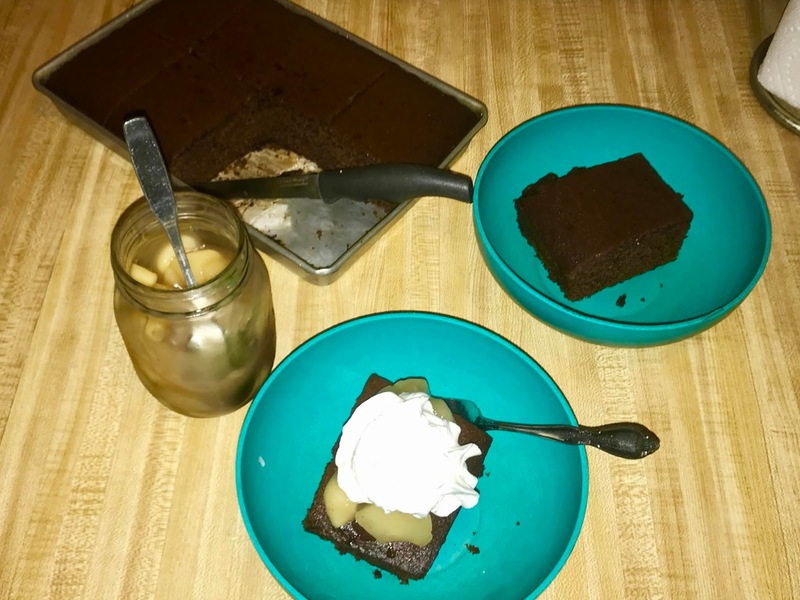 I enjoy cooking in our float cabin home the best, and love testing out new recipes. The one you liked best was easy breakfast enchiladas. 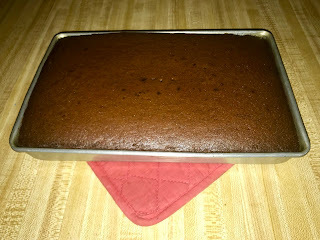 Related post: Ginger spice cake. Ginger Spice Cake hot from the oven. Wayne and I like something sweet to end our dinners. 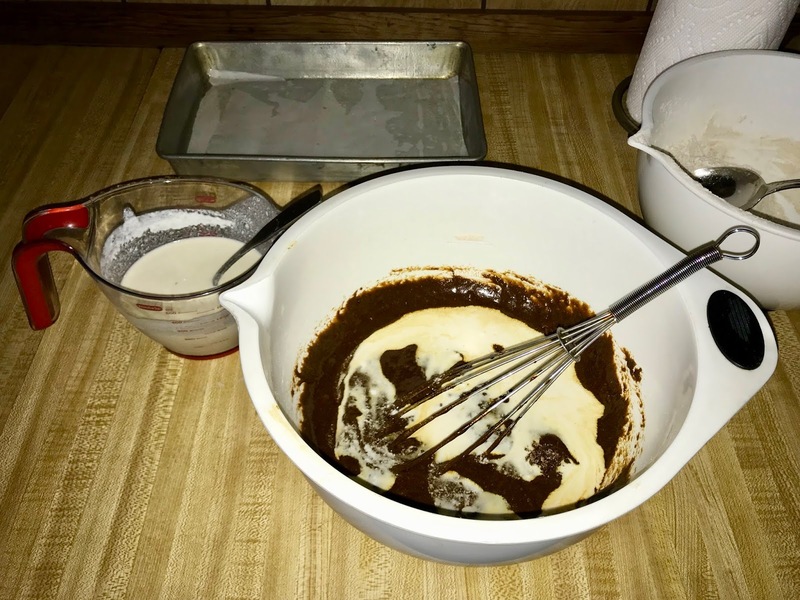 We sometimes buy pies and cakes at the market on shopping day, but after we've been up the lake at our cabin for a week or so, I get a chance to do some baking. This week I wanted something spicy and sweet, so I picked Ginger Spice Cake. I reviewed my cookbooks but didn't find a recipe that sounded "just right." I went online and found one at Epicurious. Mix wet and dry ingredients separately. Mix together in small batches. Preheat the oven to 350°F. 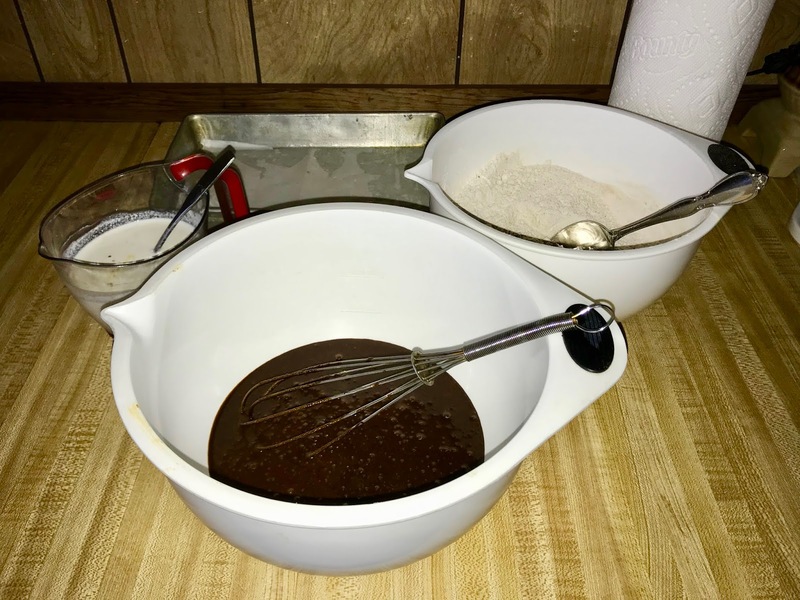 Coat a 9-inch round cake pan with nonstick cooking spray. Cut parchment paper to fit the pan bottom and place it inside. I chose to use a rectangular pan for easier cutting. Sift the dry ingredients into a large bowl. In the bowl of an electric mixer, beat the egg, molasses, sugar, and melted butter until thick. 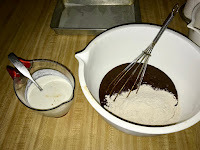 I don't have an electric mixer so I used a whisk and mixed by hand. Mix well between each addition. Gradually mix in the dry ingredients in 3 batches, alternating with the buttermilk. I didn't have any buttermilk so I added one tablespoon of lemon juice (or you can use vinegar) to a cup of regular milk and let it sit for five minutes. Beat for 1 minute after each addition to incorporate the ingredients and strengthen the cake’s structure. Mix until the batter is smooth. Pour into a prepared cake pan. 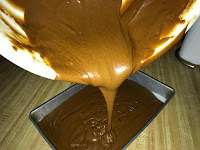 Pour the batter into the prepared cake pan and smooth the top until even. Bake for 35 to 40 minutes or until a wooden toothpick inserted into the middle of the cake comes out clean. My cake took 50 minutes in my propane oven. I didn't frost my cake. I served it with a spoonful of the Apple Pie Filling I canned earlier in the week and a dollop of whipped cream. Topped with home canned Apple Pie Filling and whipped. cream. 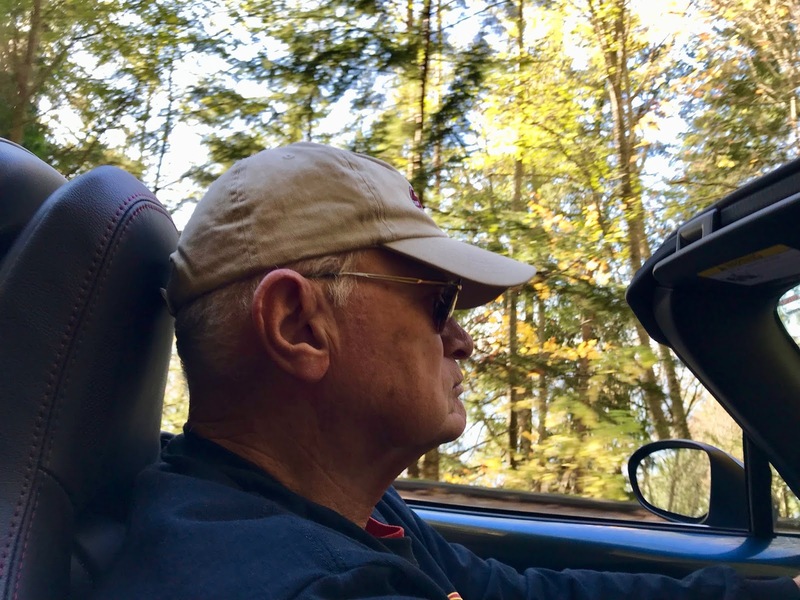 On sunny fall days, Wayne and I like to take road trips. Recently, we chose Chuckanut Drive from the Skagit Valley to Bellingham. We were heading back to Bellingham from Skagit Regional Airport where our Piper Arrow is getting her annual inspection. 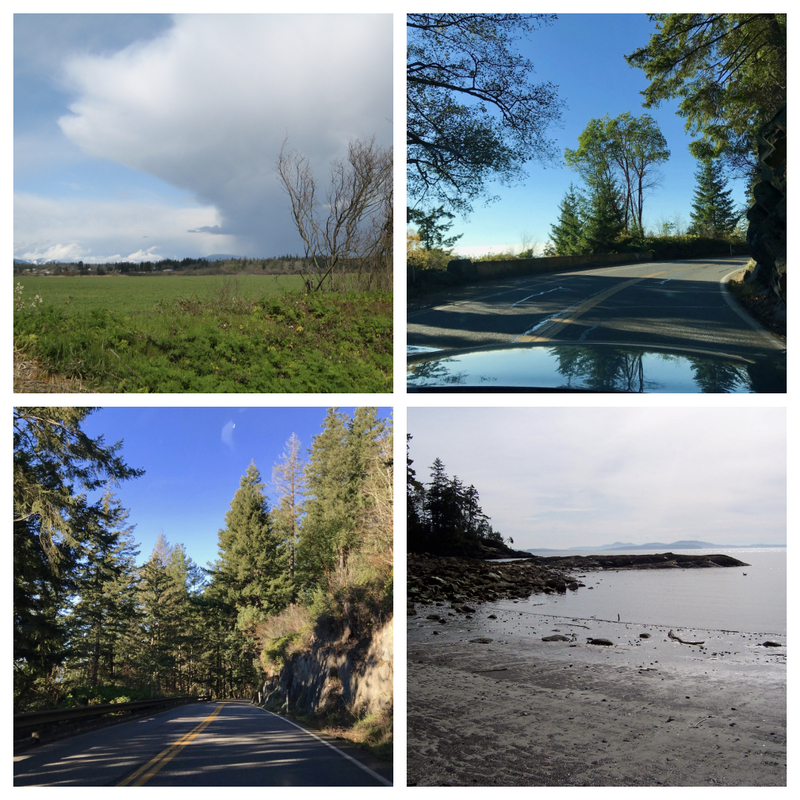 If you choose the other direction, heading south does give you the best views of the Puget Sound and San Juan Islands. 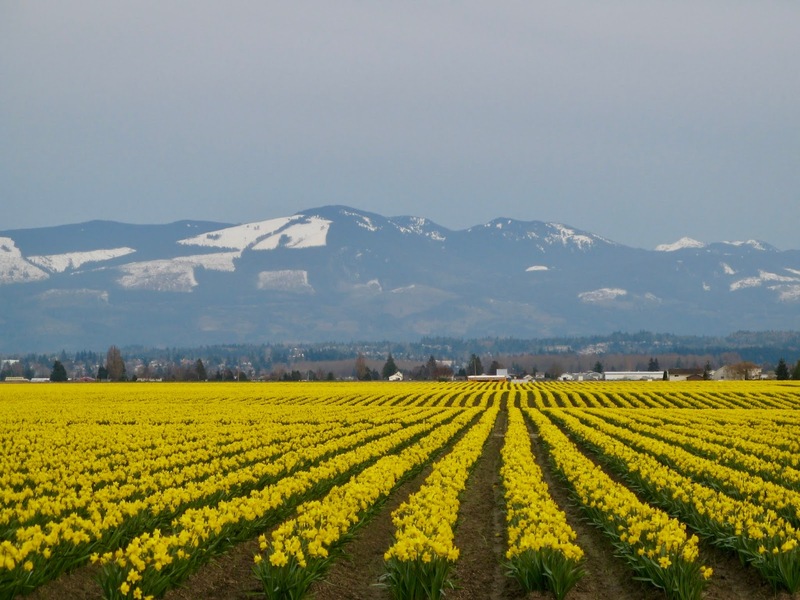 Skagit Valley is well known for tulips in the spring. 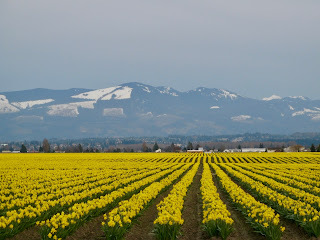 Heading north from Skagit Valley, take the Chuckanut Drive (Highway 11) exit from I-5 and make a right turn at the traffic circle on the west side of the freeway. From the north, take the Cuckanut Drive (State Highway 11) exit from I-5 in Bellingham. 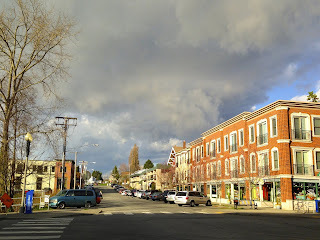 The road passes through Old Fairhaven, an interesting destination of its own with lots of quaint shops and restaurants. All along the drive there are spectacular views. This is particularly true south of Larrabee State Park. Turnouts are available to stop for pictures. There is also trailhead parking for a variety of Chuckanut Mountain Trails and the Interurban Trail that runs all the way back to Fairhaven. Some trails allow mountain bikes. On this trip, we didn't stop at any restaurants along the drive. Well known ones are the Chuckanut Manor Seafood and Grill, The Oyster Bar and the Taylor Samish Oyster Bar and Shellfish Farm. Parking is limited along the busy road and both are somewhat pricey. If you've been to either of them, maybe you can leave a comment with a review. 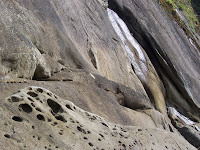 Rock formation at Wildcat Cove. South of Bellingham, is Larrabee State Park. Follow signs to the Boat Launch in Wildcat Cove for unobstructed views of Samish Bay. 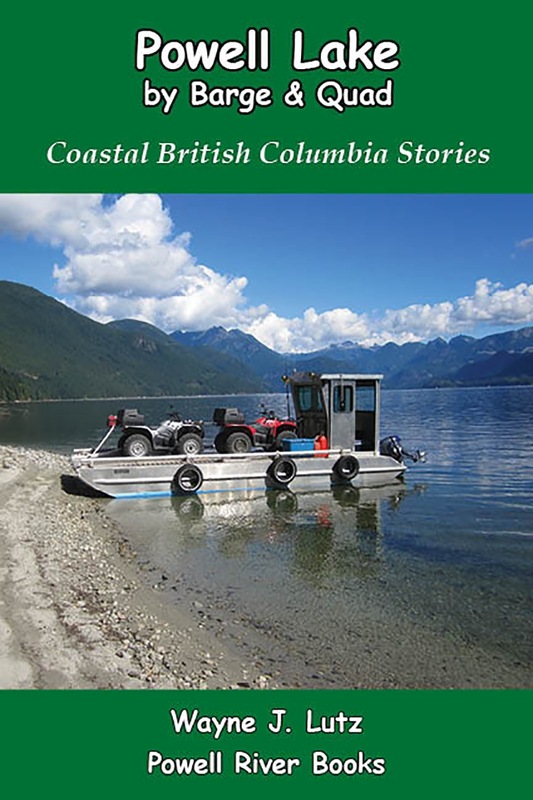 Parking is free and $5.00 to launch a watercraft. Gates close at dusk. There are restrooms, picnic tables and rocky shores to explore or bring a kayak to paddle the headlands. There's also a nearby year-round campground for those who want to stay a little longer. 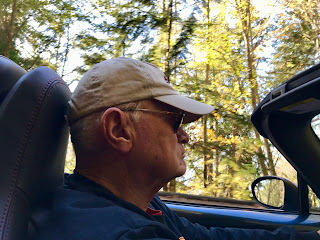 We continued on Chuckanut all the way to Fairhaven. It was a nice fall afternoon trip. One resource I use for travels and activities in Bellingham is the Insider's Guide: Bellingham and Mount Baker. It covers just about every topic you might want. You can check it out at Amazon.com. USC Galen Center basketball court. 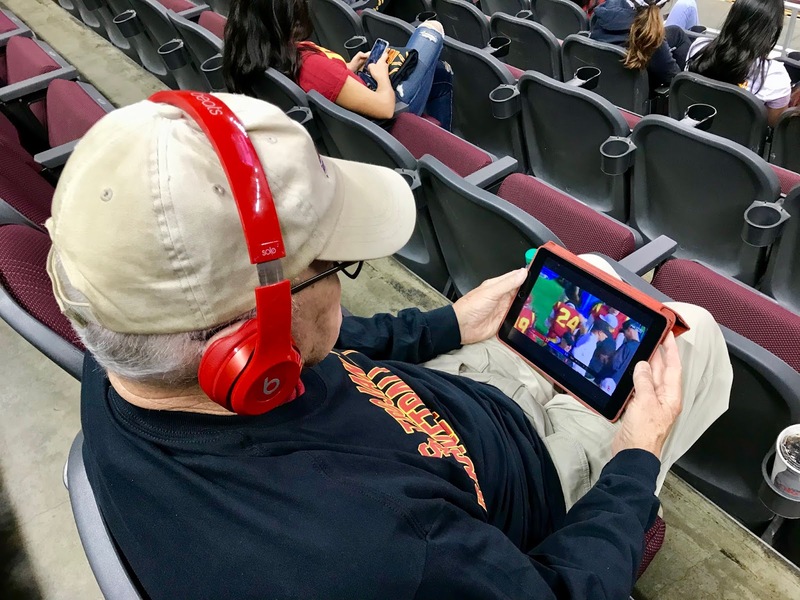 Wayne and I enjoyed lots of USC basketball last week on our fall sun and sports-cation. 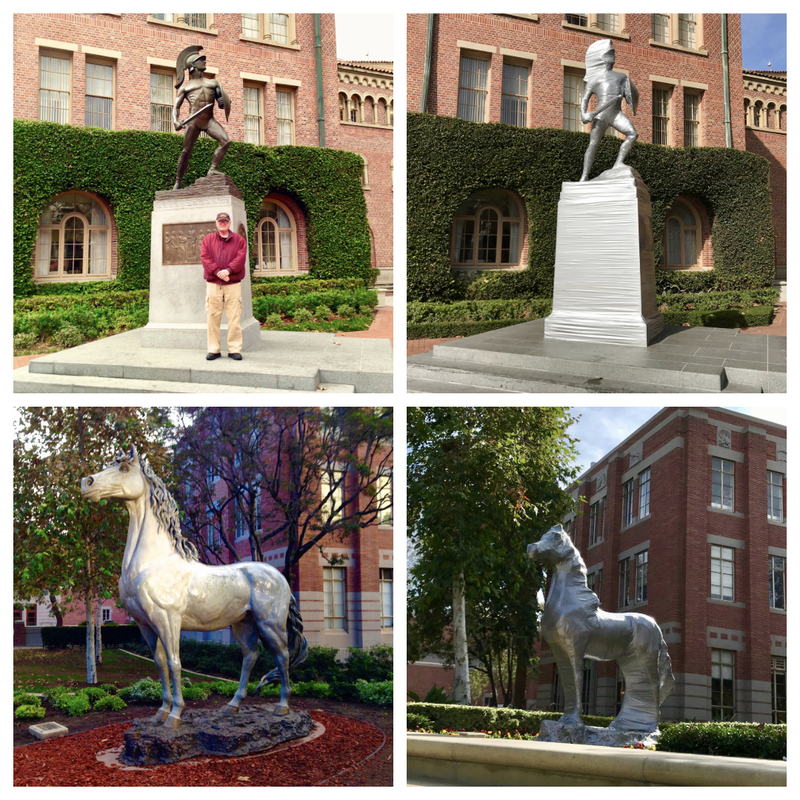 Because Wayne's a USC alumnus, we plan trips around their sports events. 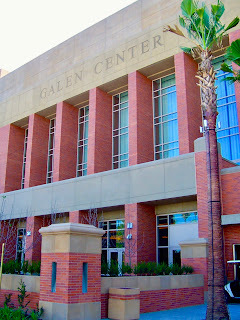 Both men and women play home basketball games at the Galen Center. It's a great venue for basketball, volleyball, concerts and other shows. The Galen Center is freeway close and parking is easily accessible just after the Exposition Blvd. exit off the Harbor (110) Freeway. We fly to Los Angeles International Airport and take a cab. It costs about $50 one way plus tip. That's cheaper than renting a car and paying parking. A bonus, most cabs have transponders to use the freeway express lanes which really cuts down on travel time and headaches. 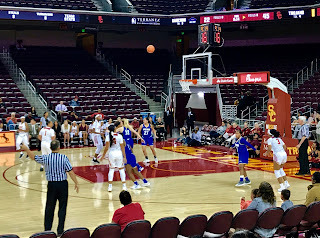 USC women's basketball at the Galen Center. Now that we live up north, we stay at the USC Raddison. that's right next door. There are several eating establishments within walking distance including The Lab Gastropub. We also take our mobile meal kit and go to Trader Joe's at USC Village to get breakfast items, salads and snacks for room meals. We enjoy both men's and women's basketball. Last week we saw one men's game and two women's. It was pre-conference so good tickets were easy to get. 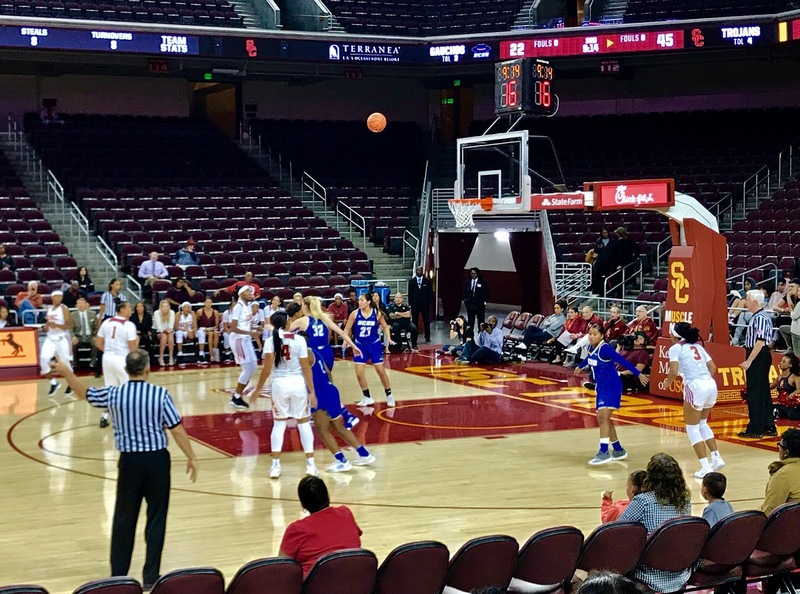 We especially enjoy women's games because the crowd is more supportive, and the women perform as a unified team, each player working with her peers to do the best that they can. 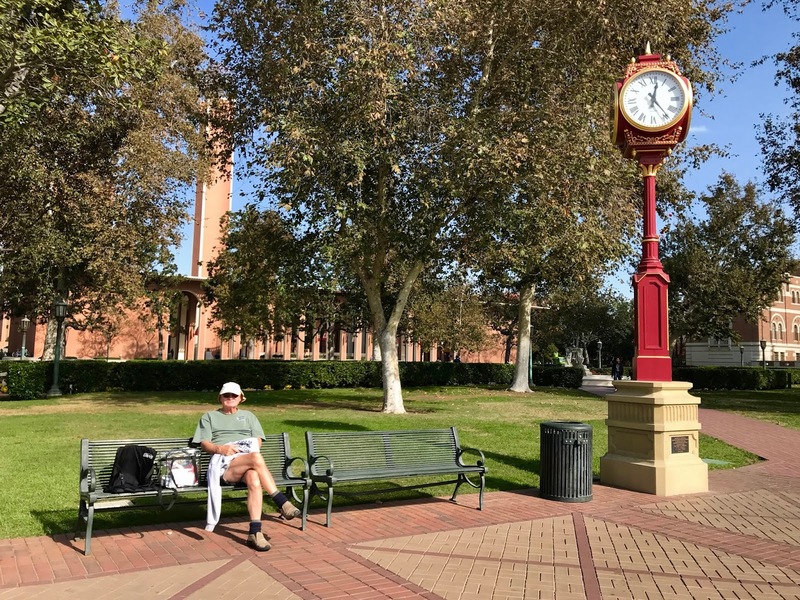 "Our bench" for sun in the USC quad. In between games we grab some of that wonderful Southern California sunshine to revitalize our tans and spirits. The location of choice is the USC quad where we can student watch while we read our Kindles. Last week was the annual rivalry football game between USC and UCLA. It was at the Rose Bowl this year so we didn't attend. But we did experience the on-campus pep rally and the duct tape wrapped mascot statues. This year SC was successful is spray painting the UCLA bear on their campus, but Tommy Trojan and Traveler survived unscathed. USC mascots before and "under wraps". Back in 2012, I sent pictures and video clips about off-the-grid living in our float cabin home to Kirsten Dirksen in Spain. 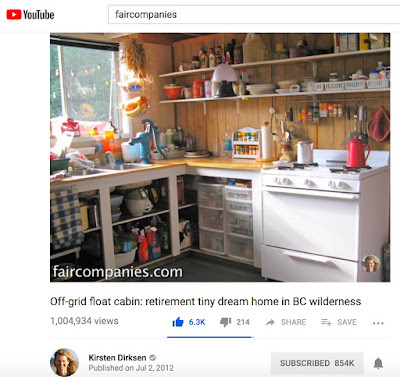 She has a YouTube channel that focuses on tiny homes, simple living and other interesting topics. A look at the YouTube page with our 1,000,000+ views. Kirsten took the raw images I sent and put them together into a video for her channel. Little did I know that the video she created would become so popular. This week it just crossed the 1,000,000 views mark. In case you haven't seen it yet, here it is. You can view it right here or go to YouTube for a larger version. Thanks Kirsten for sharing our story with so many people. Jalapeño peppers on my plant. I follow the Safe Canning Recipes Facebook page and have been inspired to try new things. 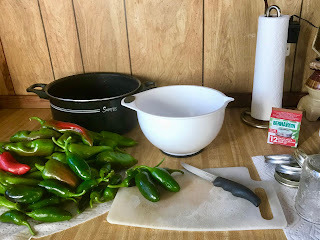 On their blog there are tested recipes, including one for something called Cowboy Candy, sweet pickled jalapeño peppers. Last year I made traditional Cowboy Candy. Then I read a Facebook post about someone who diced her peppers to make it into a relish. This week I gave it a try with the last of my jalapeño and Anaheim chili crop. Click here and scroll down to read the recipe online at their website. You can use any variety of pepper from mild to hot. Since I was using up my crop, I didn't have 3 pounds. The end result was three half pints rather than nine. The last of my pepper crop ready to be diced. Using gloves to protect your hands, slice off and discard the stem ends. To make the relish version, dice the peppers. Use gloves, it really helps. Bring the vinegar, sugar, turmeric, celery seed, granulated garlic and cayenne pepper to a boil. Reduce heat and simmer for 5 minutes. Bring syrup to a boil. Add the diced peppers and simmer for exactly 4 minutes. Use a slotted spoon to transfer peppers to clean, hot jars. Fill to 1/4 inch from the rim. Bring the syrup back to a full boil. Boil hard for 6 minutes. Ladle the boiling syrup into the jars over the diced peppers. Insert a knife to remove any air pockets. Add more syrup if needed to maintain a 1/4 inch headspace. Spoon the diced peppers into hot jars and boil the syrup. Wipe the rims with a damp paper towel and cover with two-piece lids to finger tightness. Process half-pints or pints for 10 minutes in a water bath canner. Begin timing after the water reaches a full boil. After the time has expired, turn off the heat and let the jars rest in the canner for 10 minutes. Remove jars with canning tongs and let them rest undisturbed for 24 hours on a cooling rack. Then check seals, clean the jars with a damp cloth, remove the rings and label. 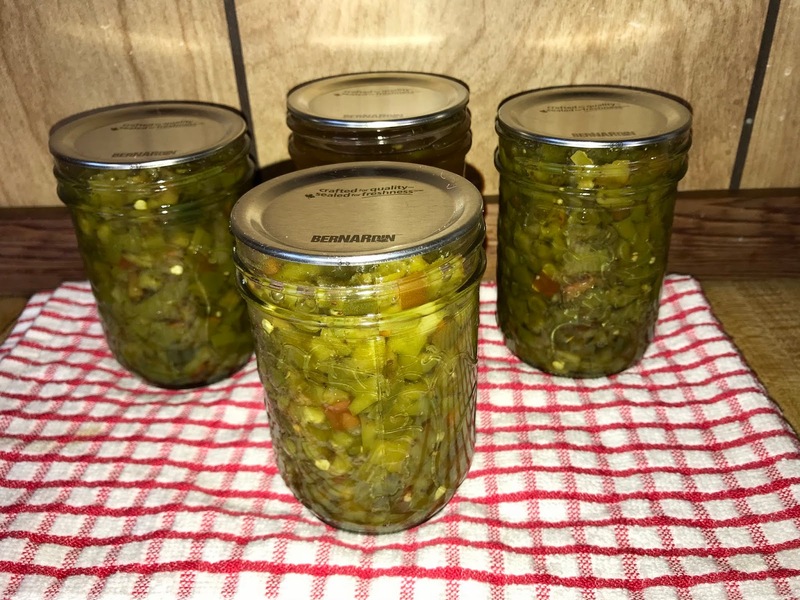 Three half pints of Cowboy Candy relish and one jar of sauce. If you like hot condiments, this is the one for you. If you have extra syrup, you can process that as well. It’s good brushed on BBQ meats. Motoring out looking for some wind. We've had an amazing run of warm sunny days this month. October is usually more erratic, but with a stationary high sitting over the Pacific Northwest we've had some amazing weather. We decided to take our 19' O'Day Mariner daysailer to town on the weekend rather than our Hewescraft. We knew it would take longer, about four hours if we sailed tacking the whole way (which we didn't), rather than 25 minutes in the powerboat. But the thought of all that warm sunshine helped us make the decision. The beautiful maples on the hillsides turning to fall yellows and orange were a bonus. Colourful maples on the south side of Goat Island. The next day we used our spinnaker to get a push. We made better time and had to motor much less. We got two thirds of the way before the wind shifted. 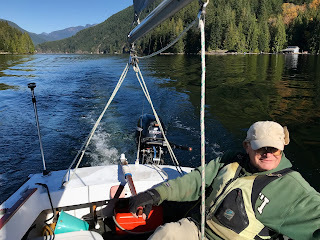 We took the sail down and used the outboard kicker to get us through First Narrows and back to our float cabin home. Wind in the spinnaker taking us home. Wayne and I used to be what he calls "cityfolk" in his books. I was born and raised in Compton, California. You don't get much more cityfolk than that. 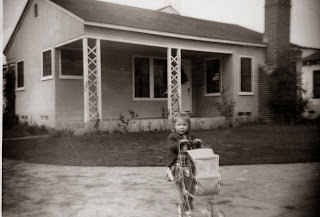 When my parents were young, it was a small town. Mom's family were farmers and Dad's ran a corner grocery store. They each were the first in their family to go to college, and both became teachers. Now my small hometown has been swallowed by the urban sprawl emanating from Los Angeles. There's nothing rural about it any longer. Daddy's girl hiking in Lassen National Park. Because both of my parents were educators, summer vacations were for camping trips, many up the coast to British Columbia. 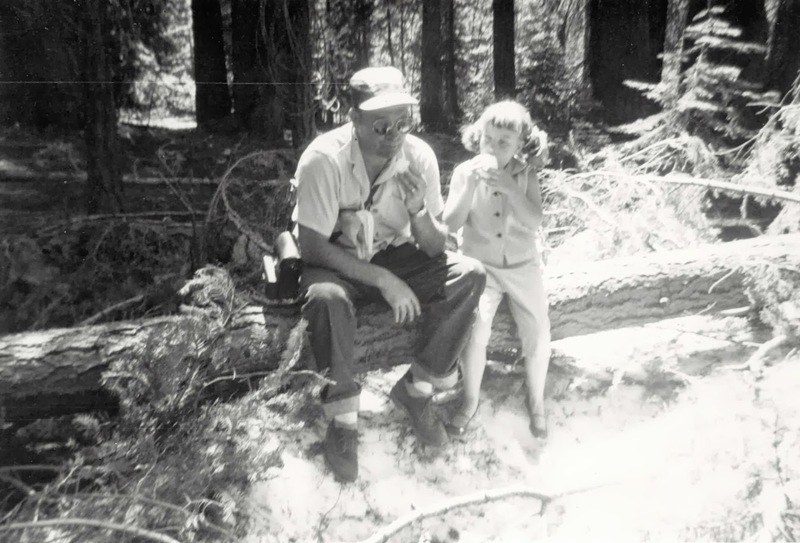 I learned to love the outdoors and fished alongside my dad. Mom, Dad, and I (I'm a spoiled rotten only child) hiked, went to ranger talks, and learned lots about nature. The seeds for my future life were planted. 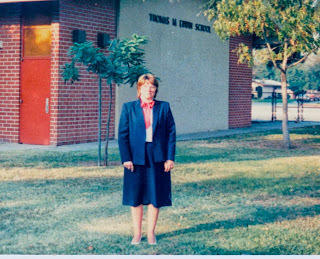 Principal of Erwin Elementary School. Following in my parent's footsteps, I went to college and become an educator. I taught kindergarten like Mom and then became a school administrator like Dad. Those were great years. I met Wayne, and we found we had lots of common interests. That's been one of the strong points in our marriage. 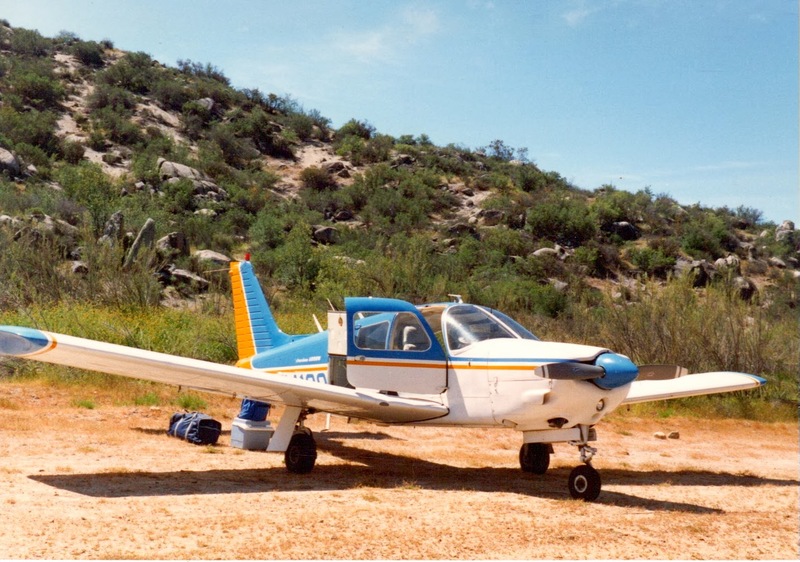 He taught me to fly, and we purchased Piper Arrow 997. 997 in her original paint in Baja California. We traveled far and wide in 997 to places like New York, Cancun, James Bay (the tip of Hudson Bay), and the Arctic Ocean. Many years included camping under the wing of our airplane in British Columbia. On a trip in 2000, we discovered Powell River, BC. 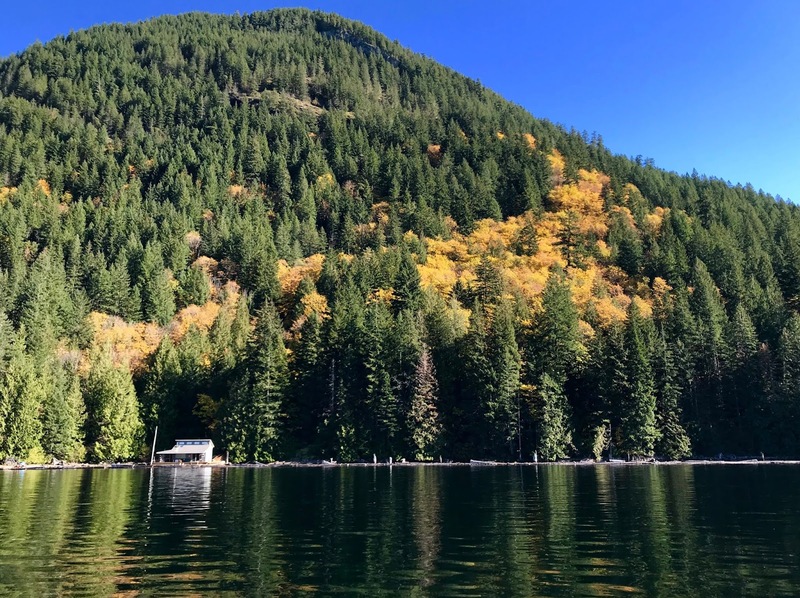 We returned in 2001 and discovered Powell Lake with its unique floating cabins. That was the moment we started the transition from cityfolk to a new way of life off the grid. 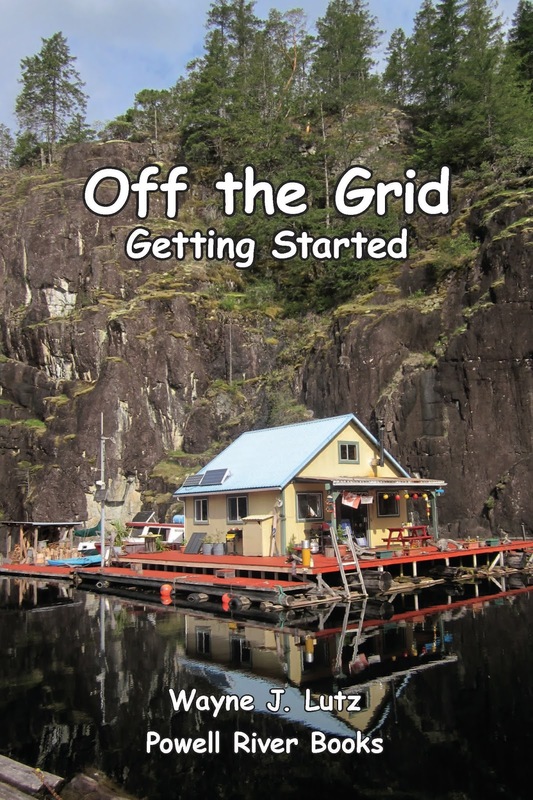 We had to learn new skills for our new off-the-grid lifestyle, and quick. That's where our good friend John comes in. 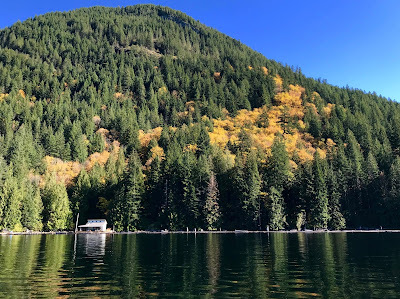 Our float cabin at Hole in the Wall on Powell Lake. We bought his Cabin #3 at Hole in the Wall, and we lovingly say "he came with it." John has remained our friend and patient mentor. 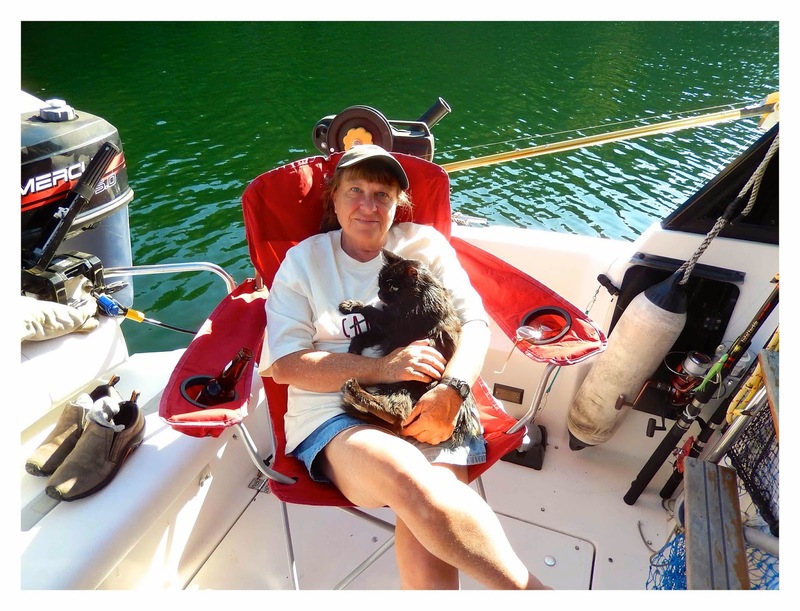 After taking early retirement from our careers in education in 2005, Wayne and I wanted to spend more time in all seasons at our float cabin home. The solution was to become Canadian permanent residents in 2008. 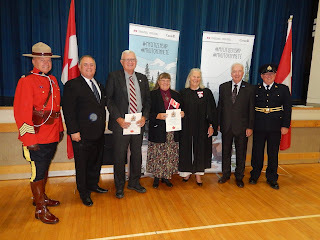 That decision evolved into becoming Canadian citizens in August 2018. Dual citizenship has lots of benefits for us in both countries. Powell River, BC, from the Texada Island ferry. You never know what life has in store. Wayne and I never want to go back to our cityfolk roots. The slower pace in a small town like Powell River fits us. We spent years looking for a place to retire. Like many things in life, the solution found us. Are you looking for a small, safe, forward thinking place to live? Take a look at Powell River. I like to follow themes in my pleasure reading. One theme was climbing Mt. Everest. I could never do that in real life, but I could experience the adventure through published accounts and memoirs. Lately, I've been reading about hiking the Pacific Crest Trail. It's something I could never do, even in my youth, but through reading I can do anything. 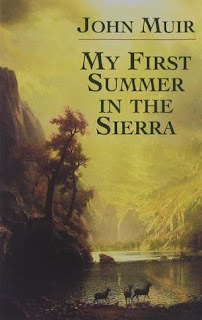 Many authors mention John Muir's classic My First Summer in the Sierras. I found mine at the Cozy Corner used bookstore in Ferndale, WA. It's also available for free legal download at the Project Guttenberg website. John Muir was a Scottish immigrant. In 1849 he came with his parents to settle in Wisconsin. John always had a wanderlust spirit, but an eye injury in 1867 inspired him to take long cross-country "walks" and sailing adventures. In 1868 he sailed into San Francisco and made California his home base. Not long after his arrival, Muir walked through the San Joaquin Valley and up into the high country of the Sierra Nevada range herding sheep. 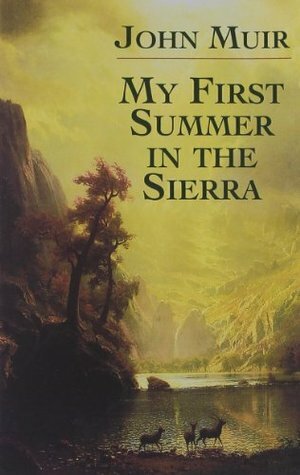 In 1911, he used his journal of the that trek and summering in the Yosemite valley as the basis for his book, My First Summer in the Sierras. The book is filled with detailed descriptions of his natural surroundings and is illustrated with his own photographs and drawing. John Muir was instrumental in getting Yosemite set aside as a National Park, and was one of the founding members of the Sierra Club. The John Muir Trail (JMT) through his beloved country was named in his honour. From Mt. Whitney to the Yosemite Valley it runs mostly in conjunction with the Pacific Crest Trail . I was inspired to read Muir's story after references to it were made in other books about the Pacific Crest Trail. If I had it to do over again, I would start with his classic work. I came to California 100 years after Muir landed in San Francisco. 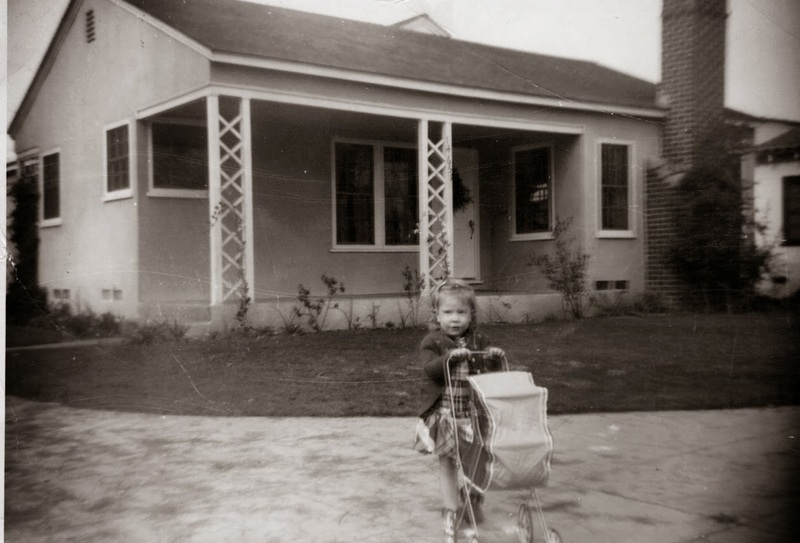 I came in a different way however, I was born as a second generation Southern California native. I vividly remember camping in Yosemite Valley before there were numbered sites and reservations. I remember ranger talks and watching the Firefall from Glacier Point. When I was older, I remember standing in the meadow to watch President Kennedy ride by in a motorcade. Here's a video taken by another family on that special day. Click here for my review. Of the three books, this was my first and favourite. 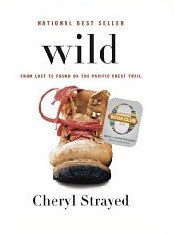 The movie version of Wild with Reese Witherspoon that followed wasn't as good as the book in my estimation. 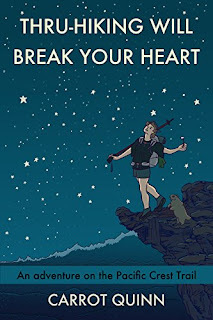 Thru-hiking Will Break Your Heart: An Advrenture on the Pacific Crest Trail by Carrot Quinn. Click here for my review. 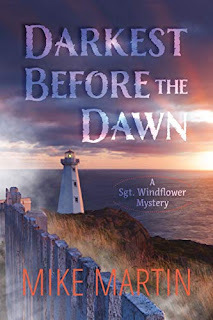 Carrot is an unusual individual that is blunt in her approach to life and writing style. She sought out hiking the Pacific Crest Trail to give her life more purpose. 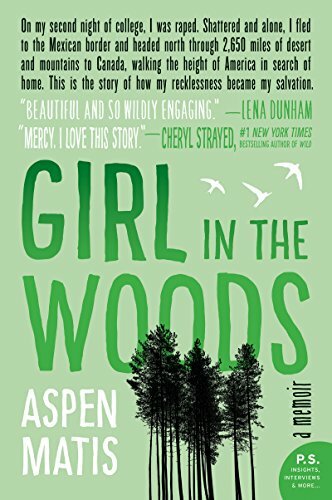 Girl in the Woods: A Memoir by Aspen Matis. I didn't write a separate review for this book. 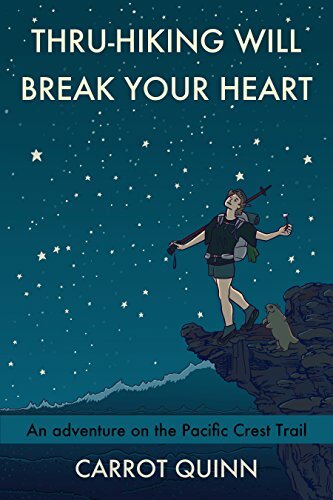 Like Wild and Thru-hiking, this memoir is about a woman who suffered trauma and used the grueling hike to find her way in life. Aspen's descriptions of her past and trail relationships were even more graphic than Carrot's. 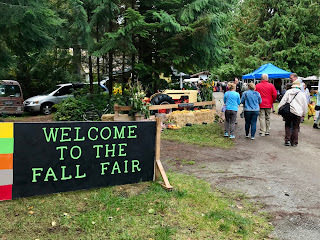 The annual Fall Fair celebrates food security. Food security is more in the news these days, especially in small remote towns like ours. Locavore is a popular word to describe participating in the local food movement. The Powell River Food Security Project works to ensure that everyone, especially vulnerable people, have access to the foods they need to stay healthy and thrive. To help get the word out about home gardening, they host the annual Edible Garden Tour. Garden Club members share information at the Fall Fair. 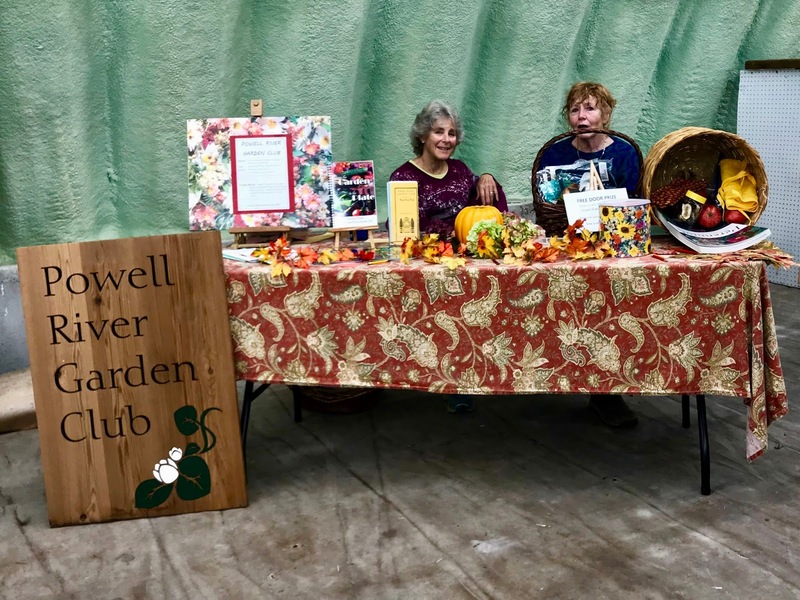 The Powell River Garden Club supports home gardening with monthly meetings to share ideas and listen to guest speakers. The Powell River Farmer's Market provides local farmers with the means to get products to local consumers. 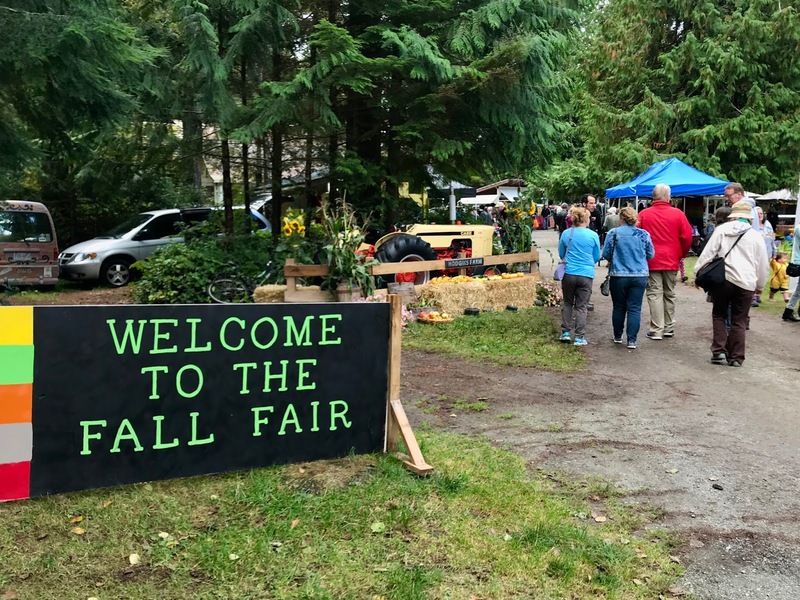 At the end of the growing season they highlight local efforts at their annual Fall Fair. In addition to Saturday and Sunday seasonal markets, there are others in the region, some during winter. It's difficult for me to get the the farmer's markets. My solution to food security is a kitchen garden at my floating cabin home. Some items produce year round, but my main harvest starts in June and lasts through October. 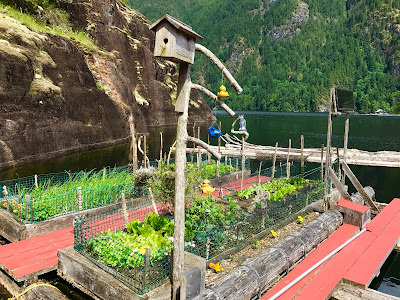 My floating garden with four raised beds and a solar watering system. 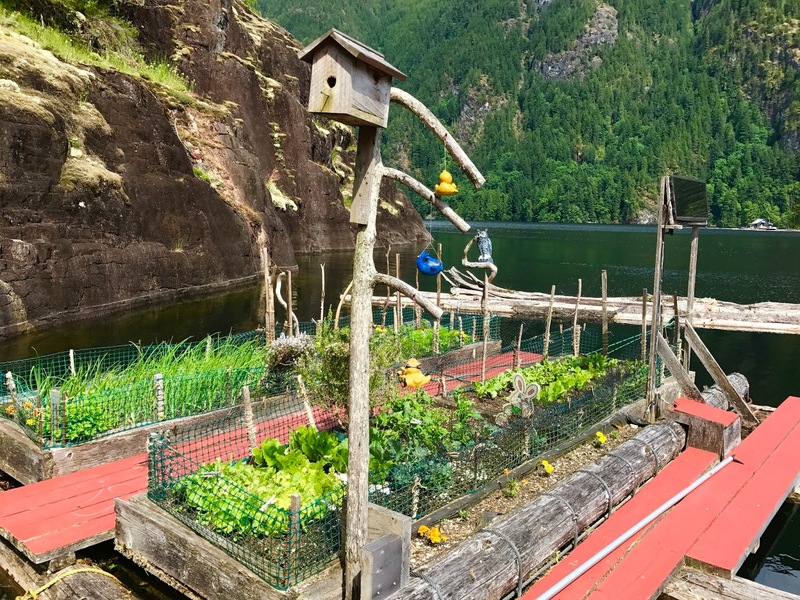 My garden floats on the lake. It has four raised beds that I use for crops like beets, carrots, kale, chard, broccoli, onions, garlic, lettuce, spinach and herbs. It's amazing how much you can produce in 160 square feet. Container gardening in blue barrels. To increase my growing space I use containers on the decks. 55-gallon plastic barrels cut in half make great growing spaces for plants like blueberries, red currants, rhubarb, tomatoes and potatoes. 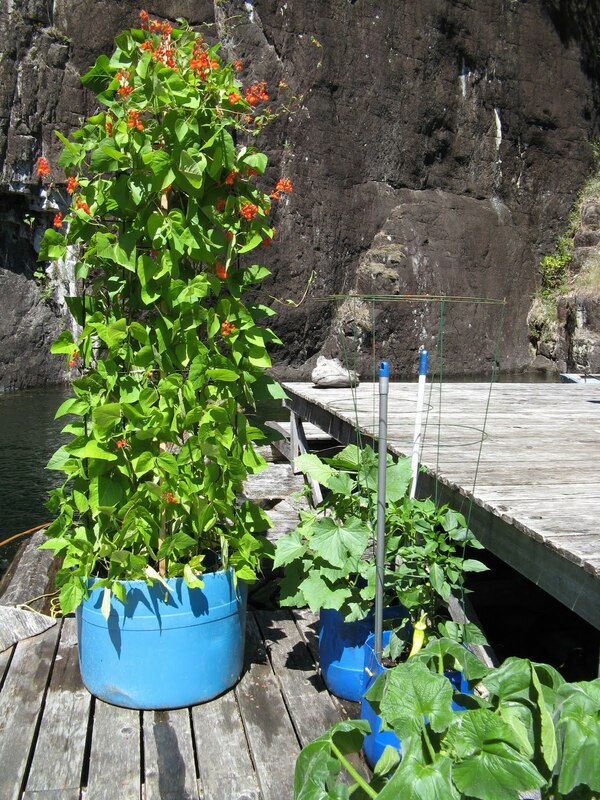 Smaller containers work well for peppers, eggplant, zucchini, winter squash, beans, peas and more herbs. August and September have been a time of plenty. We eat most of our produce fresh, thus reducing our dependency on grocery store items. To preserve some for winter I've canned jam, pickles and relishes. I've hung onions and garlic, dried herbs, stored potatoes and saved seeds. Beets, carrots, broccoli and kale will stay in the garden for winter harvesting. Later I will pressure can the last of my potatoes and carrots. Each year I have one plant that's the best. 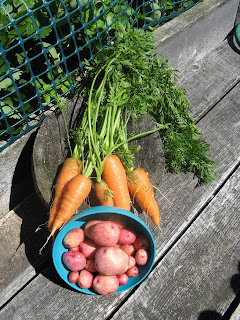 This year it's my Scarlet Nantes carrots. I usually get small ones since my float garden has shallow beds. But this year they are huge! The larger ones must be reaching all the way down to the bottom of the bed where it meets the lake water. Maybe that's why they are so large, they have a steady supply of moisture when days are hot.